Last summer we had an unusual plant pop up in our lawn. I was walking out to the garden when in the green, green scenery, something looked odd. Upon closer inspection, we had what I believe to be an albino milkweed. There was a second, much smaller, version as well. We were intrigued and mowed around this and gave our silvery plants extra water when it got dry and checked on them every day. Unfortunately, the smaller one didn’t last very long. We managed to keep the bigger one alive for a couple months, but it eventually withered away and died. I would have loved to collect seeds from this beautiful plant but it wasn’t meant to be. 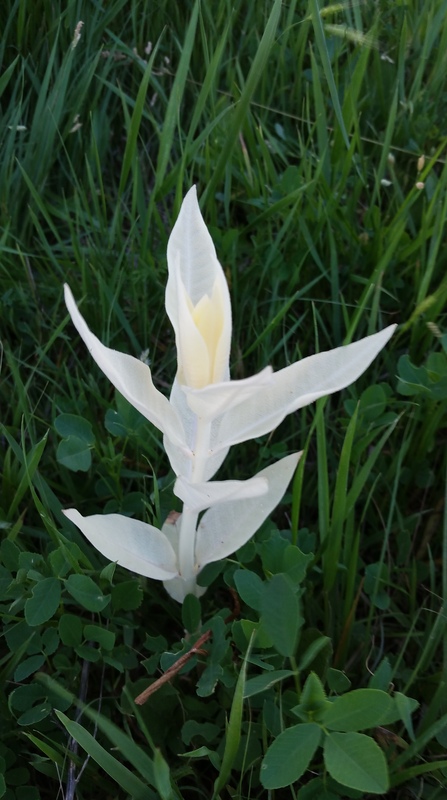 Have any of you ever found albino versions of common plants? I would love to hear about them!